This is a story of reinvention, beginning when we turned 60. My husband and I found ourselves unemployed. Being unemployed is not that unusual in Washington, DC, but we'd never been jobless together. A mortgage, college tuition for our youngest, and our self-esteem were all in jeopardy, as we did not have a Plan B. Or a fat savings account. I wished I was an RN and David was a lawyer so we'd have an easier time finding employment. Using all our contacts, we madly looked for jobs. Then we decided to be consultants (a typical trajectory in Washington.) Consulting and the constant supplication it requires didn't agree with us. Plus, it was 2001 and we had no interest in working for the Government. After a year, we realized we were done with Washington and Washington was done with us. Lurking deep inside my soul was a sense that we'd be great at inn keeping. David was reticent, but nonetheless a little desperate. Our search for the right B&B began in earnest. Within months, we had moved across the country and purchased Anne Hathaway's Bed & Breakfast. Our only real preparation had been playing host for years, and I'd been collecting salts and peppers, with the excuse that someday we'd need them. Our introduction to our new life was swift. We arrived in town one day. The next morning before 7, I had my first lesson in scone making, we bought the place at 9 and welcomed new guests at 3. We had signed away our life and gotten not only the building, but the guests in their beds and the milk in the refrigerator. Ashland, Oregon is the home of the world-class Oregon Shakespeare Festival, to which hundreds of thousands of people come each year, February through June. This book highlights our experiences hosting theatre lovers, actors, newlyweds, travellers, and just about every other type of person you can imagine. Scone by Scone…Tales of an Innkeeper's Life, shares what it's really like backstage at an inn, through stories of the myriad situations an innkeeper faces. Whether it's producing an impromptu wedding one afternoon, discovering that a guest was my host 20 years ago in a remote village in Africa, or introducing actors to early morning breakfast – nearly every day has brought another fascinating story to our door. Each chapter contains not just our recipe for business success, but also the recipe for whichever item on our prize-winning menu is featured in the story. Neither of us had ever run a business and we had definitely never worked side-by-side 24/7. It wasn't long before marital discord erupted over who was in charge of what, who knew best how to grill sausage, how to handle the guest who woke all the other guests -- much drama behind closed doors. Our trip to marriage counseling is the focus of one chapter. Underpinning all the hilarity and fun was the business derring do that continued to be our hallmark. We expanded from 6 rooms to 16. We put our children on our Board of Directors. We expanded the gardens. We served a grand English tea every afternoon. To our surprise, we discovered that innkeeping is indeed our vocation. It's inspiring, transforming work, and calls on skills we didn't know we had. And is laced with entirely unexpected ingredients – the love and friendship of many amazing people who came to us as guests but whom we now count as treasured friends for life. After a lifetime on the East Coast of building communities, Donnan Beeson (Deedie) Runkel moved West with her husband David in 2002 to take over a struggling bed and breakfast that caters to theaterlovers attending the Oregon Shakespeare Festival. As a dear friend said, she went from public service to serving the public. Over many years spent in Baltimore, Harrisburg, Philadelphia, and Washington, Deedie opened a camp for inner-city kids including her own, employed Saul Alinsky tactics to improve lives in an increasing racially segregated city, promoted public libraries and legal aid for older people, and worked to reduce world conflict through the US Peace Corps and the anti-nuclear war organization Peace Links.Woven throughout these varied endeavors was Deedie's gift for story-telling and writing. She comes from a family of readers and activists whose American roots go back to Quakers who settled in Philadelphia at the time of William Penn. Her father was both a local politician and the author of an unpublished book on the Molly McGuires, 19th-Century women activists who fought for better conditions for Pennsylvania coal miners.Deedie majored in English at Penn State, where she met her husband when they both wrote for The Daily Collegian. Just recently, she earned her Master's degree in Fine Arts in writing from UC/Riverside. Her first book, an autobiography titled "Boxes: Lifting the Lid on an American Life" was published in 2010. Her opinion pieces and articles have appeared in The Philadelphia Bulletin, The Washington Post, The New York Times, Friends Journal, and other publications. She's the mother of three and grandmother of two grandgirls. 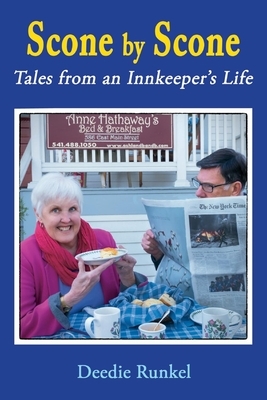 A savory mix of innkeeper's anecdotes and tasty recipes. Bon appetit! The stories about an Innkeeper's life are hilarious and heartfelt. The characters are unforgettable, the recipes delectable. But it's Runkel's flair for treating life as a delicious challenge, and for treating the most outrageous guest with grace, that make this book such a rich meal." There is something comforting in knowing that good, smart people still exist...and that they've made you a scone and a cup of tea and would like to chat a bit...which is what it's like reading Deedie Runkel's wonderful book. There's no palace intrigue here, just the story of a life well-lived, and the glory of deciding that it's always the right time to change your life completely."